I’ve been at here for about 4 and a half years now. I’m from Bristol and have always been obsessed with eating so when looking for jobs i’ve always followed my stomach. I used to work in a butchers and have worked in loads of cafes and things. Why did you join the Season + Taste group? I was working in a cafe and really needed something new. The guys had been recommended to me by loads of people. 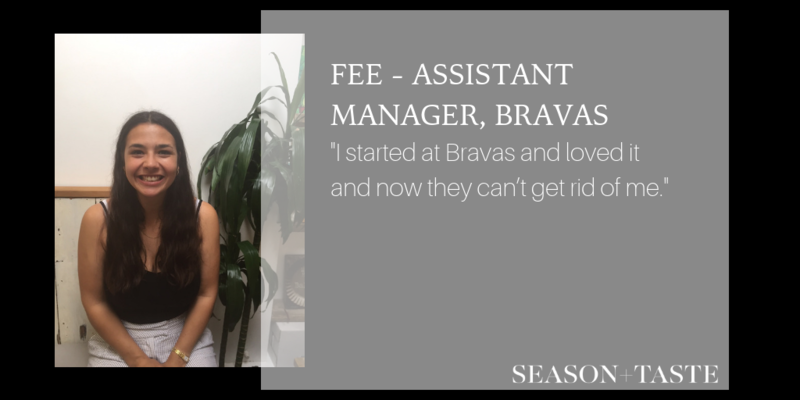 At the time I wasn’t really thinking about the role as a career but I started at Bravas and loved it and now they can’t get rid of me. I just love working with people and the team I work with are great. Also, being able to work across all the sites when people need a hand means the job is like being part of proper family. It can be really stressful but you’ve just got to get on with it. This is my lifestyle now and I love it. What sort of training have you been on? Loads. I’ve got my level two WSET (Wine and Spirits Education Trust) award. I’ve been on a computer course, because I am rubbish with computers, I’ve done Barista training and I have my personal licence. Plus, I’ve been to Spain for research. If you like people, busy environments and that buzz and the satisfaction of working in a wicked restaurant then you’ll probably love it. Also, it’s one of those things when you’re younger you think oh it’s just a job and not a career but everyone has a chance to progress here. Everyone has a skill, we have someone who started as a waitress and now she’s doing all our graphic design work. Tash was a waitress but turns out is wicked handy so now goes and fixes everything- she does loads more than just that but it’s just an example that your role isn’t fixed. I feel i’m on my right path. I really love it, I really love the people and what I do. I’m really bad at the office. So, right now I’m happy with going with it and seeing where I go, and I know if there’s something I really want to do I can talk to them. Your favourite venue is always the venue you start in so it’s got to be Bravas, it’s like going home for me. You get very protective of your venue. Previous PostPrevious BRISTOL FRESHERS – WE’VE GOT A JOB FOR YOU!